Should I Eat Yogurt For A Healthier Digestive Tract? The Food and Agricultural Organization and the World Health Organization have taken up recent initiatives to regulate probiotics in over-the-counter supplements and medications. Due to their health benefits, the probiotics present in yogurt render it a healthy choice for gastrointestinal health. By definition, yogurt is a coagulated milk product that is formed due to the fermentation of lactic acid in milk by Lactobacillus or Streptococcus. Other bacterial species, however, may be incorporated to attain specific characteristics of the product. Chandan & Nath describe these bacteria as starter cultures for the formation of yogurt that function symbiotically or are interdependent for survival and function (acid production) in the product. This enables these organisms to survive in the high acid environment of the gastrointestinal tract. Dairy products are well known for their rich nutritional value and the health benefits they provide. Yogurt is rich in a variety of nutrients such as proteins, fat, B-vitamins, calcium, zinc, phosphorous, and magnesium. Among the various health benefits, yogurt is best known for the advantages it offers to the health of the gut. The bacteria used to produce probiotic foods like yogurt bind to the intestinal brush borders and help in preventing harmful pathogens from entering the gut. 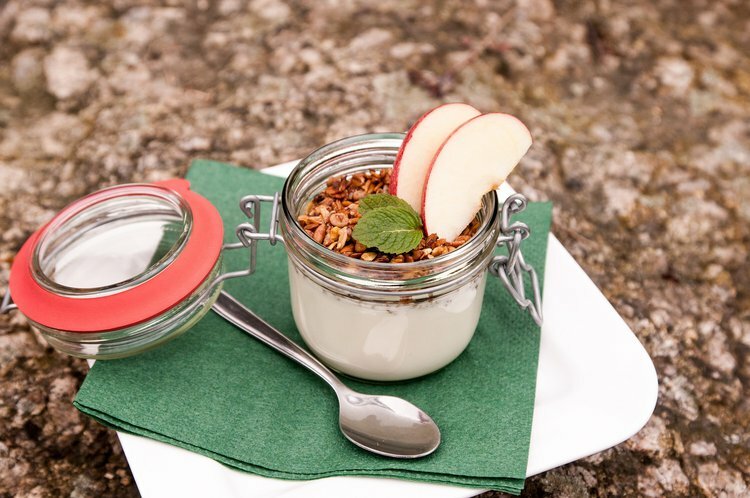 The live microflora in yogurt promote carbohydrate digestion in the gut. Xylans (fruits, vegetables, milk and wheat), pectins (present in apples, carrots, plums and oranges) and fructans (present in onion, garlic, wheat, etc.) are all complex carbohydrates that depend on the gut microflora for their breakdown and digestion. Lactose broken down in the gut can promote lactose digestion, which is especially beneficial for those who have lactase deficiency and lactose intolerance. The breakdown of lactose and production of increased lactic acid helps in promoting calcium absorption. In the case of HIV patients, their stomach hydrochloric acid reduces considerably. Stomach acid is required to digest all foods and its absence can cause unprocessed or incompletely digested foods to enter the gastrointestinal tract, causing discomfort, malabsorption and difficulty sleeping. Yogurt can enhance this acid production and thus the bioavailability of most nutrients. Yogurt is also known to enhance immune function of the body. Probiotic foods, like yogurt, aid in treating ulcerative colitis. Probiotics could aid in treatment and prevention of relapse of Crohn’s Disease. Chandan, R., & Nauth, K. (2012). Yogurt. In Handbook of plant-based fermented food and beverage technology (2nd ed., pp. 213-233). Boca Raton, FL: CRC Press. Adolfsson, O., Meydani, S., & Russell, R. (2004). Yogurt and gut function. The American Journal of Clinical Nutrition, 80(2), 245-256.